The SOUTH Water Treatment Plant serves the City of Sebree, Beech Grove, and portions of Henderson County. 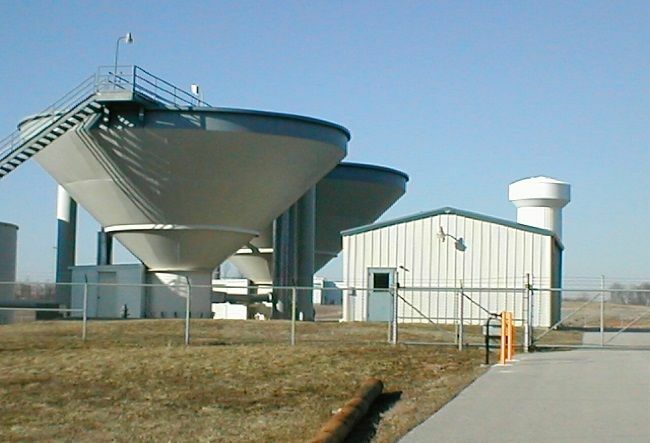 Henderson’s South Drinking Water Treatment Plant (SWTP) began operation in 1996 near the southern county line of Henderson County in Robards, Kentucky. It was designed by then General Manager of HWU, Mr. Bobby Gish and is capable of producing 4.0 million gallons per day of treated water. Built primarily to supply water to Hudson Foods (now Tyson Foods, Inc.) the SWTP also supplies water to the City of Sebree, Kentucky, Beech Grove, Kentucky and the Robards area through the Henderson County Water District, 24 hours a day, 365 days a year. Source water is supplied to the SWTP from the Green River which is part of the Green/Tradewater Basin. The total area of this Basin is 11,500 square miles. The SWTP is one of fifty-one public water providers that use water from this basin and uses approximately 3.5 million gallons of the approximately 88 million gallons of water withdrawn from the Basin each day. The overall health of this watershed is deemed to be good, but it is also heavily influenced by and vulnerable to varying sources of contaminants such as agricultural, coal mining and oil & gas production runoff as well as individually owned septic systems. All of these can contribute to significant challenges in meeting all of the regulations for providing clean and safe drinking water. HWU South Drinking Water Treatment Plant strives to not only meet all of these regulations but to far exceed them. This plant is a member of the American Water Works Association’s Partnership for Safe Water. It also participates in and has received awards from the Kentucky Division of Water’s Area Wide Optimization Program (AWOP). The operators and administrators of Henderson Water Utility take the responsibility of providing safe, clean water very seriously and also take great pride in what we deliver every day. HWU considers it a top priority to maintain a reliable source of potable water to its customers, even during the emergencies and equipment malfunctions that inevitably occur. 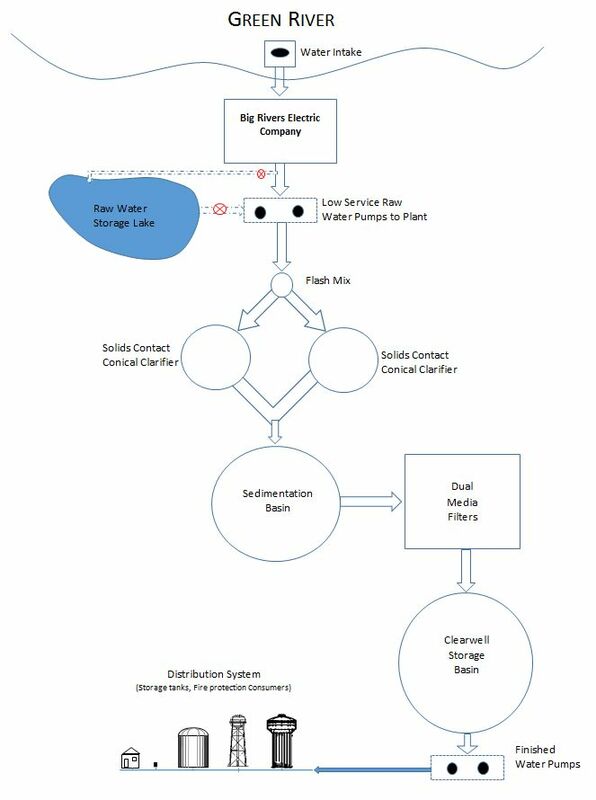 To provide for such a condition where supply water is concerned, there is an emergency bypass line installed that can accommodate a quick connection of a hydraulic pump to convey water into the treatment plant. It is important to note that once the water reaches the headworks, gravity moves the water through the various processes and into the Clearwell. Water treatment at the SWTP utilizes both physical and chemical processes to remove contaminants and disinfect the water received from the Green River in making it safe and usable for customers. Two 2800 gallons per minute (4 Million Gallons per Day) influent pumps transport water to the SWTP. These pumps are powered by Variable Speed Drives which allow plant operational staff to control the speed of the pump in order to make adjustments to the influent flow as demand fluctuates. The raw water source is an intake operated by Big Rivers Electric Corp., which provides cooling water to the Reid/Green/HMP&L power plant complex. The SWTP draws raw water from this cooling system, prior to use by the power stations. Chemicals such as chlorine dioxide and sodium hypochlorite (bleach) are used for the disinfection of pathogens, which are present at varying levels of concentration during different seasons and conditions (i.e. rainfall, snow melt, planting season etc…). Other chemicals, such as coagulants and polymers, are added to speed up and enhance physical processes. These chemicals create electrical charges that bond, or “tie” together suspended particles in the water (like in a chain) that would take a long time to settle out otherwise. Some particles are so small and lightweight that it would take hours, even decades, for them to naturally settle to the bottom of an undisturbed body of water. The chemicals we introduce cause these particles to attract to each other, becoming larger and heavier, so that they either settle to the bottom or get filtered out of the water. The process of these particles attracting (bonding) together is called coagulation. The particles are called “floc” and the process of building floc is called flocculation. Picture in your mind a particle as being a tiny magnet. As it moves through the water it attracts other magnets, becoming larger and larger. Eventually the one magnet becomes part of large mass of magnets that can be more easily settled or filtered out. The SWTP employs Solids-Contact Upflow clarification in two claricone-style basins. These basins combine three primary physical processes of water treatment: coagulation, flocculation and sedimentation. 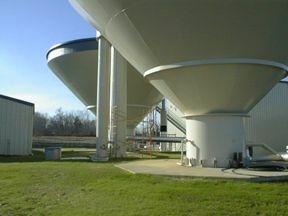 After an initial introduction of coagulant and flocculant chemicals, water enters the bottom of the cones and is forced upward in centrifugal motion. In these basins, the floc particles combine to form large suspended sludge blankets. These blankets continuously capture larger particles that are formed while allowing smaller particles of floc to pass through. In this sense, the cones include a fourth physical process of water treatment – filtration. These blankets are full of organic material. When organic material is combined with chlorine, by-products are formed which can be harmful to human health. These Disinfection By-Products (DBPs) are regulated very tightly and so the SWTP adds powdered activated carbon into the claricones prior to chlorination in order to adsorb as much organic material as possible. This minimizes the amount of organic material available to react with chlorine and thereby reduces potential DBP formation. After Secondary clarification the water is split equally into four dual media (sand and anthracite) high-rate gravity filters. These operate very similarly to common filtration units on swimming pools. Each filter is monitored very closely to ensure that the quality of water leaving the filter meets specific standards. Filtration is the last physical process. Once the water is filtered, additional chemicals are added for disinfection, pH & corrosion control and fluoridation. It is then stored in one of four storage tanks, equaling nearly 4 million gallons of capacity, and then conveyed to our customers through our distribution network. The operations staff at the plant monitor and manage the water levels in each of these tanks to ensure that our customers receive the freshest water possible – we practice a “No Drop Left Behind” policy. All along the way of the water treatment process, hundreds of observations, checks, tests and procedures are performed on a daily basis to ensure the safety and quality of each gallon of water leaving the facility. Drink with confidence.